Why I Read this Book: I needed a call to action back to the simplicity and importance of life. Walden is it. Simplicity should be a simple thing, don’t you think? Sometimes I feel like so many of us get caught up in a wicked spiral of complexity in today’s society. I unfortunately think this is especially the case for those of us really striving for success. Sometimes a reminder of life’s wonderful simplicities is exaclty what we need. 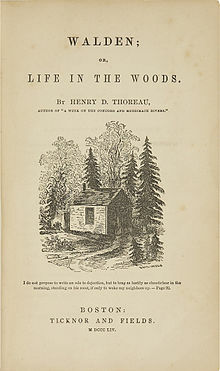 Henry David Thoreau takes us right back to the basics in Walden. Somehow I went the first 25 years of my life without ever knowing of this incredible literary work. It was not until a few months ago when a well respected friend, and wonderful liver of life, recommended I read Walden, slowly. I have received plenty of book recommendations in the past but never before has someone recommended the pace at which I read. I took his advice and spent the summer doing just that. I was facing a big career transition and just about to leave for a trip to Dubai to see what some new parts of the world had to offer. What perfect timing. Since then I cannot list the number of successful mentors and authors of our time who have recommended Walden. As we so often see, it is the presently popular pieces written generations back (in this case over a hundreds years ago) that really have the lasting and timeless impact on society. In the mid 1800’s, Thoreau set off on a quest to get back to basics. And his journey took him to Walden Pond. There he spent a couple years living life as one would if they were not continuously acting upon the ever growing social pressures of life. Thoreau went to Walden to focus on needs instead of society-generated desires. How about growing and eating just what our body needs (and really wants) to survive instead of filling our bodies with extra meat, fat and alcohol? Or maybe consuming and wearing clothes that first and foremost do what they were first intended to do; keep us warm and comfortable, as opposed to keeping up with what’s hot in the shop windows? I know it’s hard to imagine while we are wearing our newest Seven jeans but this is what he wanted to remind himself of out at Walden Pond. In these 150 odd pages, he simply tells us of his experiences and realizations of life and his surroundings. Be prepaired for details of the things that we usually take for granted and expect to spend some time with his experiences. They will likely make you do some thinking of your own. Walden puts forth an invaluable message that resonates in every part of life. We should not live and judge the quality of our lives by the things that others have and say we should have. We should not judge our success based upon what those around us consider to be success. I have said it so many times. We are successful because we say we are, we believe are and feel we are. Not because anyone else tells us we are or aren’t. Success is something only you can realize inside yourself. It is unfortunate that we get scrutinized for giving up that ‘wonderful’ corporate job to be a writer or a yoga teacher or maybe even a waiter. Maybe we love people. Maybe we want to better help others or better communicate with others. Who knows what the reason is. In fact no body really knows the reason except you, the one making the decision. We should all be encouraged to do exactly what we want to be doing and feel we are meant to do. You can bet that Thoreau received plenty of bad press for taking off to Walden Pond for those two years, but in exchange for some superficial and temporary popularity, what did he stand to gain? How about confidence and pride in doing what’s most important to him? And gaining the ability to be present in a world that continues to try to think about ten things at once and fifty steps ahead? What would that be worth to you? If Thoreau could see how much more intense our society has gotten today compared to when he retreated to Walden, I am not sure he would know what to think. And the pressures are only growing. Of course I am not telling you to skip town and go widdle sticks in the woods for a couple years. But how about just taking some time to yourself and writing down what’s really important? Why do you feel you need to make this much money or have that job or wear these clothes? Is it because you truly value all these things or is it perhaps because you have been trained to think and feel this way? What pressure and stress do these misunderstood priorities have on you? I took my trip to Walden a few years ago. It was in the form of living in Spain for 18 months and it has changed me ever since. I task you with the same exploration. Take Walden and a journal with you for a weekend or maybe even a fun longer trip to a new place with all new people. Consider doing it alone and try to take a trip back to simplicity. It’s the kind of life therapy that would do us all well. So enjoy the ride and when in doubt, try to take it slow and stay simple. There is no hurry but the one we put upon ourselves. Let me know what you learn. Hi I was wondering if you would recommend me to read Walden since I am a novice to philosophy. Also, which version of Walden is best to read? Is the one above the best version to you? One more question, are the annotated versions of Walden good to read? If so, which is the best annotated version? THANK YOU! Awesome for stopping by Julian! Walden really will give you mind a new perspective. I think it’s where all this minimalist stuff started. Pretty amazing to track down the source. I would recommend Walden to anyone regardless of background. The book is no doubt a deep and slow read, but that’s the point! I spent a whole summer reading it. As for which version, to be honest they are all very similar. The text is the important part. Maybe check on Amazon to see which text size and layout you like the most-if you are able to view inside the book. I would stay away from the annotated version though. Stick to the pure Thoreau stuff. added a little information? I am not suggesting your information is not good. , but suppose you added a title that grabbed a person’s attention? I mean Mastering the Art of a Simple Life: Walden | Live Your Legend is a little plain. You ought to look at Yahoo’s home page and note how they create post titles to grab viewers interested. about everything’ve written. In my opinion, it could bring your blog a little livelier. ne le regrette point ! !